I often hear people tell me that they eat oatmeal some mornings for breakfast but when they are in a rush, they often choose something less healthy and sustaining. "Why not try baked oatmeal?" I say - so today's recipe is an easy grab and go baked oatmeal. Make it at the beginning of the week and you have nearly a week's worth! This recipe was also good timing for me as we leave today to go back to England for a couple of weeks. I always take my own food on the plane so I have been thinking what to take for my in-the-air breakfast. 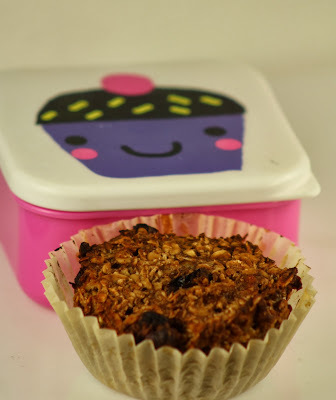 I figured if I baked my oatmeal in muffin cases, they would work perfectly! And voila! I also used up some of my quince puree too before we leave - but if you don't have quince, you can use unsweetened applesauce instead. 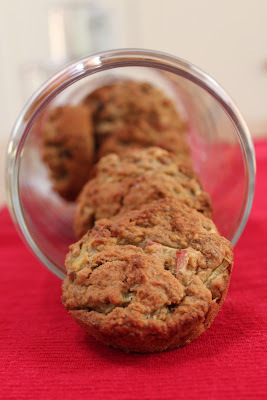 This quince oatmeal to go is gluten free, dairy free, vegan, and with no added sugar or fat. Mix all the ingredients together in a mixing bowl. Spoon into 7 muffin cases in a muffin pan. Bake at 375F for 35 minutes. To serve - just grab and enjoy if you are on the go or if you do happen to be at home, you can break one up in a bowl and pour over some extra warm non-dairy milk. Store in the fridge.